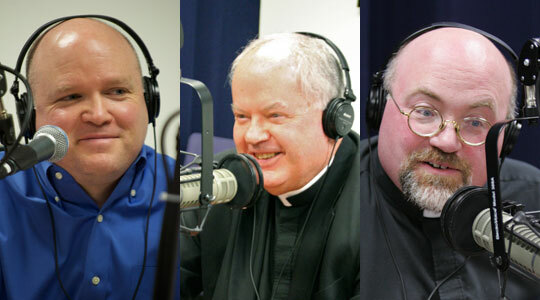 Summary of today’s show: If there’s a priest in the Archdiocese of Boston who’s worn more hats than Msgr. Dennis Sheehan, we want to meet him. Scot and Fr. Chip talk with Msgr. Sheehan about his many assignments from the Pontifical North American Seminary in Rome to Blessed John XXIII National Seminary to the Pontifical Josephinum in Columbus. After his days leading his seminaries, he stays with the student theme in shepherding St. Paul’s in Cambridge, which includes the Harvard Catholic Student Association. Today, Msgr. Sheehan provides leadership at the presbyteral council and in the archdiocesan Office for Worship. Also, on today’s show, Scot andFr. Chip discuss this Sunday’s Gospel reading and tell us why we can call our priests father. 1st segment: Scot welcomed Fr. Chip Hines back to the show as a substitute co-host for Fr. Mark O’Connell. Fr. Chip is often in the Pastoral Center on Fridays for meetings of the Clergy Personnel Board. He represents priests who were ordained in the 2000s. The board advises Cardinal Seán on appointments of priests. Scot and Fr. Chip talked about Game Six of the World Series, one of the best World Series games ever. Scot said he talked with his kids about what it was like as a Red Sox fan in 1986 to watch the ball roll through Bill Buckner’s legs in that Game Six. Both agreed that the Cardinals will likely win tonight, although they’re sympathetic to the Texas Rangers and their fans. 2nd segment: Scot welcomed Msgr. Sheehan to the show. He’s know the monsignor since he was pastor at St. Paul’s in Cambridge in the mid-1990s when Scot was graduating college. Msgr. said he was a parochial vicar at Sacred Heart in East Boston when he was first ordained. He also taught at Emmanuel College and was campus chaplain at Suffolk U at the same time. Msgr. said he studied at the North American College in Rome in Latin so he didn’t have enough Italian to be fluent at Sacred Heart. He was actually present in St. Peter’s during the opening of the Second Vatican Council. He went back to Rome on the seminary faculty in 1969. He was director of liturgy and went to San Anselmo at the Pontifical Liturgical Institute and studied nights while teaching the subject during the day. He taught at the seminary for four years. Scot said in that time, helping to form future priests in a liturgy they didn’t grow up praying, must have been a challenge. Msgr. said the liturgy was for the first time in the vernacular and celebrating the liturgy was an art in the making in those days. There were no books to consult at the time. While there he oversaw the sabbatical program for priests at the North American College, soon after it had started. Msgr. said it was a post-Vatican II enterprise, that priests had to get caught in the areas that the Church was entering. He said it was a work in the making. It included 35 priests every spring and fall from all over the United States, including American missionaries who had returned home. Hearing all the lecturers who came in to address the priests was like getting a second graduate degree. Scot said the program continues today and our own former vicar general, Fr. Richard Erikson, is there now. Msgr. said the rule of thumb was that a priest would not be admitted until he had been ordained 15 years. He said being in Rome itself was part of the formational experience. They would visit not just ruins and museums, but also meet those running various Vatican offices. They even used to take the priests to Geneva for meetings at the World Council of Churches. Today, they take the priests to the Holy Land. Fr. Chip asked how his experience in the 60s with the liturgy is helping him with the revised translations of the Roman Missal coming up. Msgr. said people should listen as the English had adopted a new style of rhetoric. He said during November, the priests of the Archdiocese will have a series of programs where they will be introduced to the rhetorical styles and new emphases of the Roman Missal. He said the current emphasis is on text, but 40 years ago they would have talked more about presence and body language and leadership. Now, they can assume much of that is known. He said one of his current topics is making liturgy a prayer for the priest. Msgr. said he hopes that the preparation doesn’t end with the First Sunday of Advent, that everyone will continue to use these revised texts as a basis for catechesis, and even richer still when people are using. 3rd segment: Scot said Msgr. has also been involved in other seminary formation. He was appointed as rector of Pope John XXIII National Seminary in Weston. At the time, he was younger than some of the seminarians he was helping prepare. (The seminary prepares men who are older and for whom the priesthood is generally a second vocation.) He said preparing men for priesthood is one of the most grace-filled experiences for every priest. Msgr. said back in the 1980s, the “older” priest was generally younger than today. They had a cut-off age of about 55, but now it’s considerably older with men in their 70s studying. The seminary attracts men from all over the country. After about six years, he was asked to be rector of the Pontifical College Josephinum in Columbus, Ohio. Msgr. said he thought by now that there was a plot to keep him out of the archdiocese. He said the Josephinum was founded in the 19th century forming primarily German-speaking or German-descent priests and he showed up on St. Patrick’s Day as an Irish rector of the seminary. Up until the 1940s, the house language at the Josephinum was German, with the object of providing German priests. In the 1960s, the mission moved to providing priests for missionary dioceses, especially Spanish-speaking. It is called Pontifical because it is governed by the Vatican. He said the history of the relationship between German-speaking Catholics and the rest of the Church in US is very interesting. The governance by the Vatican was meant to protect and preserve the German character of the seminary. He returned to the archdiocese as director of the Office of Worship in Boston and was administrator of St. Jeanne Parish in Newton. Many of those people are now at his current parish of Our Lady Help of Christians. His work in the Office for Worship was mainly concerned with laypeople, especially musicians, for leadership roles in ministry, including lectors and Eucharistic ministers. From there, he was assigned to St. Paul’s in Cambridge, which is a territorial parish, the Harvard-Radcliffe campus ministry, and the Archdiocesan Boys Choir School. Msgr. said it was probably the most interesting ministry in the archdiocese, but it was also tremendously challenging. He was there for 11 years. He said the ministry at Harvard alone included hundreds of Catholics. He said the choir school is a middle school that accepts musically and intellectually talented young people and it makes a singular impact on a young boy and can change the direction of his whole life. Scot said when he was a student at Harvard he bragged about the beauty of the liturgy at St. Paul’s. He said the homilies were longer than at most places. He felt it was more instructional and people wanted good preaching. Fr. Chip remarked on the regimentation of the altar servers at St. Paul’s with a quality he hasn’t seen since his seminary days. Msgr. said everyone should experience a Sunday Mass at St. Paul’s to see the full-range of how liturgy can be celebrated. Scot said being surrounded on all sides by Harvard university can be a great challenge. Msgr. said the students are amazingly responsible to outreach from the Church. Active Catholics at Harvard are committed and intelligent and they nourish and build up one another. Scot said Msgr. now wears many hats. One of his jobs is as chaplain of the Order of Malta. Msgr. said it is one of the oldest religious orders in the Church today and there are still 60 professed knights who live in religious life. The order in the Middle ages protected the Holy Land and took care of the sick. The charism of the order today is the care of the sick poor. A characteristic outreach of theirs was their response to the earthquake in Haiti a couple of years ago. For example, they took a small hospital they sponsor and enlarged it to accommodate many more patients. The American knights also take about 500 sick people to Lourdes on pilgrimage every year. It’s not just a social group, but they are a working group that embraces both men and women in membership. Msgr. said he’s been on the Lourdes pilgrimage about six times so far. He said you can see the heart of the order in the pilgrimage, but the work of the order is so much greater. Msgr. also works as moderator of the presbyteral council. His job is to keep the meeting on schedule and on topic. The council is a gathering of priests representative of the whole archdiocese with Cardinal Seán and the vicar general. Fr. Chip asked if it’s like herding cats, but Msgr. said it’s like watching cats get in line. Scot said his experience is that the feedback from the priests is extremely frank and open and helps shape the way we take initiatives forward. Most of the members will talk about the issues discussed with other priests and the people back in the vicariates to bring their concerns back with them. They also share the concerns of the council with the people they meet. Msgr. pointed out that the advisory board is more than just giving advice, but is very influential. Scot said this is a strongly worded Gospel. We most often see Jesus get angry at those who practice hypocrisy, especially among the Pharisees and Scribes. When he tells the people to do as they tell you, but not what they do, he’s saying they’re hypocrites. Scot said hypocrisy in the way we live our faith turns people off. He saw the Pharisees leading people away from an authentic faith to a cultural faith. Fr. Chip said Jesus uses the style of exaggeration in Hebrew to make a point. He points a heavy emphasis to make it understood that hypocrisy is not to be tolerated at all. Scot said Fr. James Martin, SJ, just came out with a book related to the humor related to our faith and said a lot of Jesus’ stories were meant to be funny through exaggeration. Fr. Chip said that people would have been laughing at the exaggerations of widening phylacteries and lengthening tassels. Fr. Chip said priests struggle with being authentic because they can’t give the impression of hypocrisy. For example, he’d love to have a Cadillac Escalade, but it would give the wrong impression about the life of simplicity he needs to live as a priest. Scot said it applies to all of us. We should talk the talk and walk the walk. Fr. Chip said we have to look at Scripture through the eyes of our time, in addition to the times it was written. Scot said it is often misunderstood when Jesus says don’t be called rabbi, master, or father. Is this saying priests shouldn’t be called father? No. Jesus is telling the Pharisees not to be a cult of personality where people are making idols of the man, but they should be directing people to follow our Father in heaven. Fr. Chip said on the first day of seminary, they tell the seminarians that if they’re in it for prestige and a cult of personality, they’re in the wrong place. He thinks of priests who do good work, but get caught up in themselves and their own following. One of Scot’s favorite authors today is Fr. Robert Barron with his new TV series and book, “Catholicism”. One thing he says is that people misunderstand Jesus as being meek. In this scene, think of how confrontational Jesus is in this situation and how shocking his words were.